Odds displayed on a screen at a sportsbook owned and operated by CG Technology in Las Vegas. With the Supreme Court’s landmark gambling decision this week, many more Americans might soon be able to place a legal wager on their favorite sport. So what kind of money are we talking about? The U.S. casino industry says Americans illegally bet at least $150 billion on sports every year. But it’s hard to measure exactly how much of that money might flow into legal establishments as a result of this decision; underground bookies don’t readily publish their balance sheets. 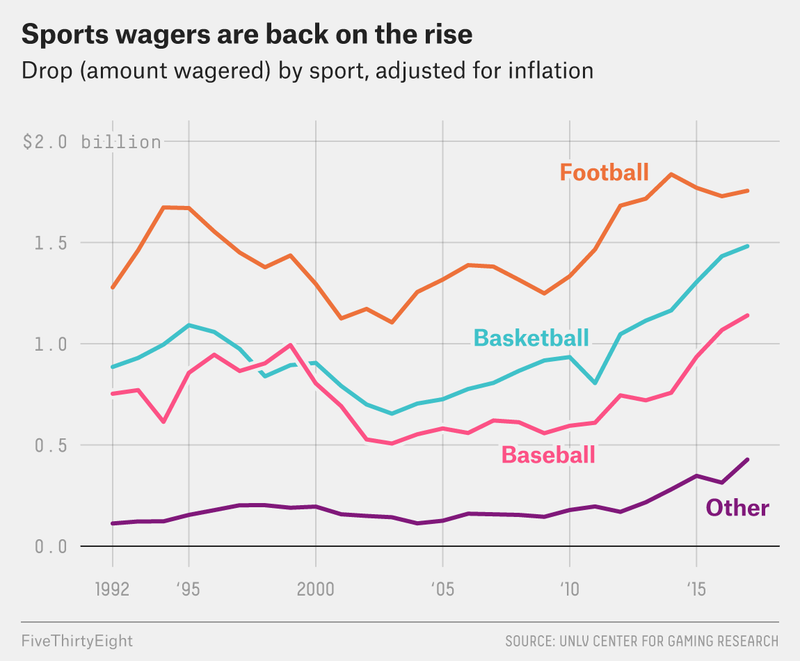 But the casinos in Nevada do, and a closer look into the action taken by sportsbooks over the past few decades gives us a window into how Americans bet on sports — and how well they’re doing. Clearly, a lot more people feel confident enough in their sports opinions to put a lot more money where their mouth is. Unsurprisingly, football has ruled this world. After cracking $1 billion wagered in 1994, in unadjusted numbers, football betting followed the industry’s slow downward trend until 2005, then bounced back upward, growing year-over-year nearly every year since. But the other sports are growing even faster: Nevada casinos’ 2017 basketball handle was $1.48 billion, 84.4 percent of the amount wagered on football take. Baseball is just a little further behind; bettors put down $1.14 billion in 2017, 64.9 percent of the football bets. Back in 1992, those shares were 69.3 percent and 58.9 percent. But even if our ability to place legal bets is changing, there’s one thing that will probably stay the same: our inability to place good bets. Despite the wealth of information available in 2018, sports bettors aren’t any better at handicapping — in fact, they’re notably worse. Let’s say you went to Hypothetical University, and you have a friend who went to Hypothetical State. The night before the big game, you go to a casino together and each bet $11 on your respective teams. The next day, Hypothetical U wins and covers the point spread, so your friend is out $11 while the casino pays you $21 — double the money you bet, less the service fee skimmed off of winnings.2 Effectively, $10 of your friend’s lost $11 went into your pocket. In this case, the “drop” (the money you and your friend dropped on the game) is $22, but the “win” (the amount the casino kept) is $1. This is the ideal: An equal number of dollars bet on both sides guarantees that the casinos’ win rate equals their service fee. But the betting public rarely obliges — and if casinos set the point spread in a way that entices more money to be put on the losing side, their win percentage goes up. But since 1992, bettors have done much better against the house in baseball than in football, basketball or the other remaining sports. That’s still true today, 11 years since casinos’ 2006 peak. Any one out of 2,430 regular-season MLB games a year could have a wildly unforeseen result — but baseball bettors have consistently put more dollars on the winning side over the past 25 years, keeping the average casino win rate below the standard service-fee average of 4.55 percent. It’s a different story in basketball, where casinos have kept 5.4 percent of all money bet on hoops over the past decade. In football, the most heavily wagered sport, casinos have kept very slightly more than the service fee (4.66 percent) over the past 25 years. Regardless of which sport(s) they’re betting on, though, today’s sports fans are betting, and losing, more than ever. Adjusted for inflation from December 1992 to December 2017. Called the take, the juice or the vigorish. The lines got “sharper,” meaning more well-informed and likely to win, while “square” means the opposite. Betting on your favorite team to win every week is square.